Camouflage is one of menswear’s greatest ironies. For a print that was designed to let members of the military go incognito, it’s pretty damn conspicuous everywhere else. It’s this brick-through-a-window level of obviousness which has made camouflage an unappealing sartorial prospect for many men. In camo you’re pretty much a walking target for judgement, admiring or otherwise. That said, much like all your other menswear favourites pilfered from the war cabinet camouflage is a stone cold style classic provided that you do it right. That’s where we come in. Here are our seven foolproof ways to don camouflage, which is trending (again) this season. It’s military precision, wardrobe style. It’s indisputable that the camo field jacket is one of the safest ways to wear the military’s so called ‘invisible’ print. Evidence of this is offered by the fact that it’s been worn by both menswear icons and street subcultures alike – the ultimate crowd pleaser. The beauty of camouflage jackets is that they’re foolproof. Anything that could be considered a wardrobe staple will have no trouble getting along with your military-inspired outer layer. A camo parka jacket, for example, will work wonders thrown over a navy suit, while at the weekend, a camo bomber can easily be recruited alongside a T-shirt, blue jeans and white sneakers. Unless yours is emblazoned with some criminally unfunny tagline, it’s pretty hard to mess up wearing a T-shirt. True to form, a camouflage T-shirt is a doddle to parachute into your wardrobe and is one of the most accessible ways to get to grips with this perennial pattern. First things first: you’ll need to go logo-free in a T-shirt because camo’s got enough action going on without throwing bold branding into the mix. As for fit, you can either take the classic route: a slim, fitted design, rolled gently at each sleeve. Or, if you want to make things feel more modern try an oversized design to join the streetwear platoon. Though to avoid accusations of being in the throes of a mid-life crisis, take stock of the number of birthdays you’ve clocked up before you attempt this. Completing the rest of your look is quite literally black and white: a pair of straight-cut black or white jeans (never blue) will do a heroic job of soothing camo’s attention-grabbing nature. Slide into a pair of grey suede sneakers and you’re doing camo without making a big deal out of it. Camouflage trousers last enjoyed mass popularity in the mid 90s when it was statistically impossible to find a boyband without at least one member sporting a pair. Since then, they’ve stepped back into their lane and rarely make an appearance outside of war zones. 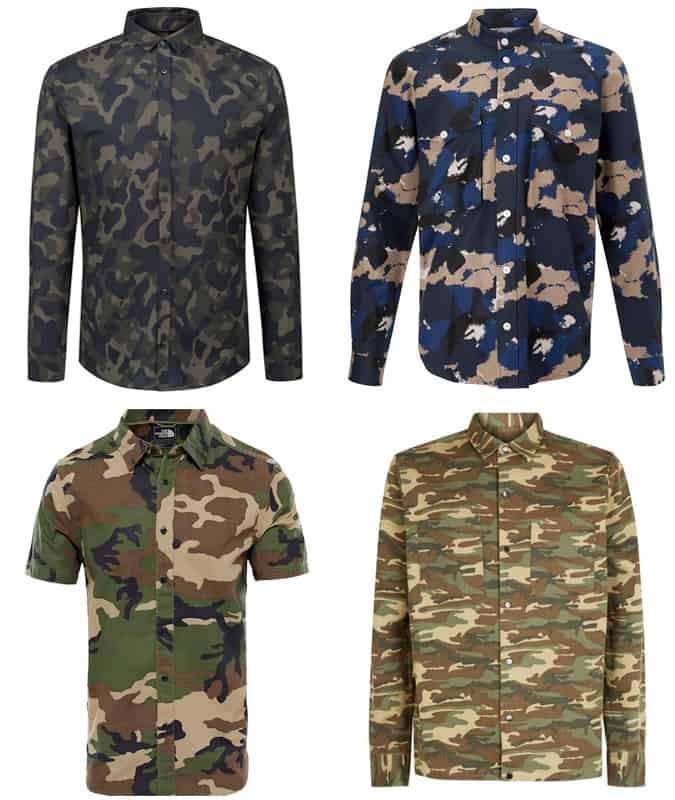 For those closet camo admirers who would rather chew off their own arm than go fully under cover, there’s hope yet. You can try the patchwork print with a judiciously placed accessory. The beauty of camo accessories is that they work well with practically every kind of ‘fit you can think of. They are a streetwear kid’s best friend: a cross-body bag, cap or backpack offers a hit of urban realness to an otherwise simple (no doubt eye-wateringly expensive) all-black look. More surprising is the fact that camo accessories are ripe for the picking for white collar workers too. A camo tote is just the thing for sprucing up an uneventful navy suit, while more creative types stand to gain serious swag from adding this hand-held hero to their fallback Oxford shirt, chino and sneakers set-up. No matter the season, the lion’s share of camo menswear has stuck to army-fatigue colours: khakis, desert sands and occasionally darker black-ops colour schemes. Until now that is. Spearheaded by luxury Italian design house, Valentino, the print has started trying new colours on for size and the result sits somewhere between camo as we know it and a lurid paint palette. Discretion definitely isn’t the objective here. With all those colours and shapes on one garment, colourful camo is not the kind of thing you can pick up off the floor and run out of the house in without taking fire (usually from your mates). Extreme caution is necessary. Swerve colourful camo on your legs unless you’re opting for shorts as we’ve yet to see trousers work IRL. Instead, choose a camo outer layer such as a jacket or overshirt which you can slip on over a white T-shirt and blue jeans without feeling completely and utterly ridiculous. Want something a little more adventurous? Try bright camo outerwear over a classic navy suit for a streetwise (but still smart) wardrobe switch up. Any man who has survived puberty will have worn camo shorts at some point, but it’s a mission that rarely goes well. Camo shorts are a hard look to pull off without looking like that drunk guy at a music festival who’s lost all his friends. The first things to bear in mind are how much fabric and how many details you’re looking at. If you go in for all those bells and whistles (voluminous pockets, zips) then you give off nutty-survivalist vibes. Tailored camo shorts are a much safer option, again letting the loud and proud print do all the talking. Add a pair of penny loafers and a white T-shirt or knit and you’ve successfully avoided crap camo. That’s not to say you can’t go for a more battle-ready pair though: just be wary of how much detail is on offer. By choosing large pockets, zips or drawstring hems (but never all three) you can nod to this garment’s heritage without going full squaddie. As well as Vietnam veterans, the camo shirt seems to be standard-issue for rebellious teenagers. But wear it without that humblebrag band T-shirt and those scruffy skate shoes and you’ve got a thoroughly grown-up wardrobe addition.